Daryl Baldwin, director of the Myaamia Center and esteemed language revivalist, has many to thank for the revitalization of Myaamia language and culture within his tribal community. Daryl Baldwin makes a point in the classroom. Even in light of his recent achievements — including a MacArthur "Genius" Grant and being named the commencement speaker for Miami's graduating class of 2017 — Baldwin remains focused on both the community which he serves and the relationships that he's helped build over the years. The connection between Miami University and the Myaamia Tribe of Oklahoma has thrived for more than 45 years. In 1972, Chief Forest Olds made an unexpected visit to campus, and on a second visit in 1974, he met President Phillip Shriver. Since then, both groups have worked diligently to learn and grow alongside one another. According to Baldwin, the success of this relationship is largely based on respect. "This effort is about learning from each other," says Baldwin, "which requires mutual respect and a willingness to be committed to something that is still evolving." Baldwin continues, "Miami University has allowed for Myaamia language and culture to be revitalized within the campus setting. The engagement of students and sharing of cultural knowledge has made this a rich experience in diversity for students who come into contact with the work of the Myaamia Center and its staff." This unique commitment to diversity education helped solidify the relationship between the school and the Myaamia tribe with the 2001 creation of the Myaamia Project (renamed in 2013 the Myaamia Center). The initial idea for the Myaamia Project occurred in 1999, with discussions between tribal members such as Chief Floyd Leonard, Julie Olds, and Baldwin, as well as key figures within Miami's College of Arts & Science. Reed Anderson, former associate dean of the College of Arts & Science, saw promise in the idea. As the chair of the Department of Spanish and Portuguese in the 1980s, Anderson recognized the importance of revitalizing the language and culture of the Myaamia people. After several months of planning and preparation, Miami officially sanctioned the Myaamia Project in 2001. Baldwin was appointed as the director, and the pioneering work of language revitalization could officially take root on Miami's campus. "The unique thing that Daryl had," Anderson says, "is that his vision was that all of the work they did was not for the greater glory of the individuals doing the research, writing, programming, and design…but it was for the people of the tribe." Daryl Baldwin demonstrates some features of the Myaamia language to students. Since its inception, the Myaamia Center has assisted the Miami Tribe in educational development through research that provides critical language and cultural content for curriculum, teacher training, and community programing. Additionally, this work is shared on campus through class visits and a wide range of interactions with faculty, staff, and students. Miami supports the Myaamia Heritage Award Program for tribal youth. Beginning in 1991 with just three students, the program now has 32 tribal students on campus. The program is designed to allow interested tribal members the opportunity to not only come to Miami, but to continue learning about their heritage language and culture through a series of EDL 1-credit courses taught by Myaamia Center staff. These courses are in additional to their regular course work and focus on areas of Myaamia language, culture, history, ecological perspectives, and modern tribal issues. These classes are important to their intellectual development as Myaamia citizens of their tribal nation. The center is unique in itself, as this type of relationship between an indigenous tribe and a university is rare in the United States. 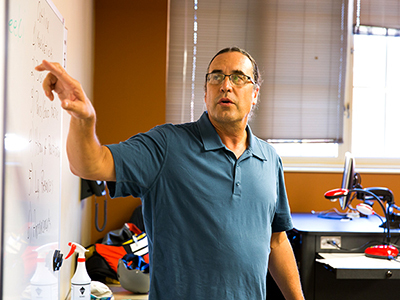 The language revitalization efforts conducted through the Myaamia Center have influenced other tribes who are seeking to revitalize their languages from documentation. The last native speakers of the Myaamia language passed away during the mid-20th century. For many Myaamia people, the loss of language had direct negative effect on preserving their culture. With the help of linguist David Costa from the University of California, Berkeley, Baldwin and other members of the Myaamia tribe began reintroducing the Myaamia language back into their community. This was done through the transcription of centuries-old missionary texts and comparison with related languages. Currently, there are approximately 300 Myaamia tribe members who use the Myaamia language on a daily basis. "I believe a language can be revived without speakers if properly documented," Baldwin says, "but you also have to recognize that changes occur in any revitalization process." With this passion for revitalizing their native language, Baldwin has challenged terms such as "dead language" and "extinct language," encouraging people to use terms such as "sleeping" or "dormant." In January, Baldwin was selected as the commencement speaker for the graduating class of 2017. Baldwin seeks to connect to this graduating class by telling the story of the Myaamia Center and of the Myaamia perspective on knowledge. "As Myaamia educators, we often say 'knowledge is responsibility' so that our students understand that as a learner they have an obligation to share what they are learning with others, and to also take great care in that sharing process." The 2017 Spring Commencement is scheduled for Saturday, May 13 at 1:30 pm. Read more about Baldwin's background in the January 2017 Miami press release Miami "genius grant" winner Daryl Baldwin to address graduates May 13.